Control the traffic to stop criminals escaping the Police. Traffic Crisis 2040 is a traffic management game, with the goal of blocking intersections to prevent criminals from escaping Police chases. It was made for the Global Game Jam 2013, and picked up several awards from the Melbourne Jam Site, including Most Original and the Rising Star Award. 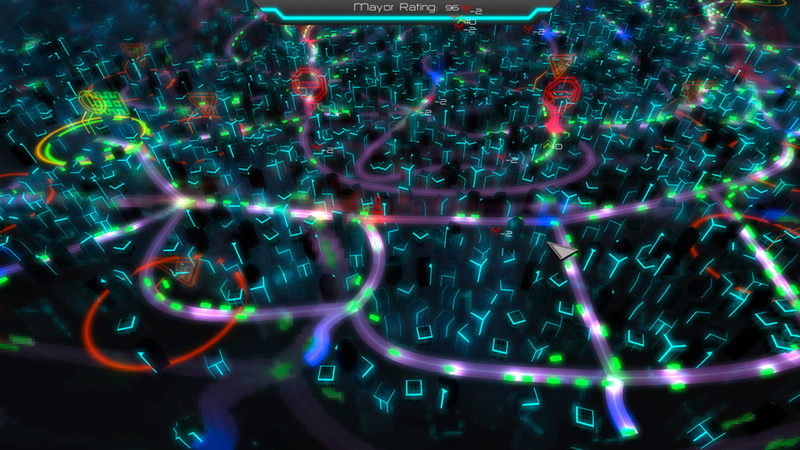 Players click on each intersection to block traffic in all directions, with the goal of stopping criminals escaping the city. However, they must balance this with the happiness of the civillians, who will get mad if they are held up for too long. This game was created during the 48 hour Global Game Jam. I acted as the 2D artist and UI designer, where I tasked myself with creating an interface that used as much iconography as possible, reducing the potential translation load if the game were to be released as a commercial product. I also collaborated with the lead designer & project manager of the group to create the gameplay concept and rules for the traffic simulation that was created within the first day of development. The game itself is rough around the edges, like a majority of titles produced from a 48 hour Jam, but it can clearly be improved in terms of giving additional feedback to players to indicate their successes and failures, along with the difficulty curve that ramps up a little too quickly for most players.